Planning a visit to Queenstown, New Zealand? You’ll find so much to see and do across the adventure capital of the world. From bungy jumping and whitewater rafting through to unforgettable burgers and awe-inspiring views, check out the attractions and activities that make up our top ten things to do in Queenstown! The home of the world’s first commercial bungy jumping operation, Kawarau Bridge remains one of New Zealand’s premier bungy jumping locations. Established in 1988 by co-founders Henry van Asch and AJ Hackett, the picturesque setting above Kawarau River sees thrillseekers take the thrilling 43 metre plunge headfirst, stopping just above the water below. The only operation in Queenstown that offers tandem bungy jumping, you can choose to jump solo or with a friend or family member in tow. Known as the adventure capital of the world, no trip to Queenstown would be complete without trying your hand at an unforgettable adrenaline packed activity. Kawarau Bridge, Queenstown, New Zealand. Image Credit: Steve and Jem Copley / CC by SA 2.0. Starting out in 2001 as a hole in the wall eatery, Fergburger has grown in popularity over the last two decades to become a true Queenstown institution. Regularly attracting large crowds who are more than willing to wait in line for one of Ferg’s iconic burgers, the eatery is said to serve up some of the world’s best. Featuring base ingredients that span from beef, lamb and venison through to fish, pork belly and chicken, and accompanied by flavoursome additions such as avocado, tomato relish, brie cheese, dill tartare and tarragon mayonnaise, every bite of every burger is sure to leave your taste buds in awe. Conveniently open from 8am to 5am, seven days a week, there’s certainly plenty of time in the day to get a Ferg fix (or two). Fergburger, Queenstown, New Zealand. Image Credit: Florian Bugiel / CC by SA 2.0. Bordered by the sparkling waters of Lake Wakatipu and the spectacular Southern Alps, Queenstown is a city that is nothing short of stunning. Although there are plenty of great opportunities to soak up the sights on solid ground, one of the best ways to see the city is with a ride on the Skyline Queenstown Gondola. Carrying you 450 metres above Queenstown to Bob’s Peak, the cable car, which also happens to be the steepest in the Southern Hemisphere, allows you to soak up fantastic panoramic views of The Remarkables, Coronet Peak, Lake Wakatipu and the city below. Queenstown Skyline Gondola, Queenstown, New Zealand. Image Credit: mat79 / CC by 2.0. Boasting a unique microclimate that allows for the growth of varietals such as Pinot Noir and Chardonnay, the area surrounding Queenstown is home to a large number of successful vineyards and cellar doors, including Amisfield Vineyard, Gibbston Valley and Peregrine Winery. Enjoy a tasting of local specialities, settle in for a meal with amazing winery views or spend some time learning about the winemaking process. It’s easy to visit the region’s wineries on your own, but a variety of wine tasting tours operate in the area, removing the stress of organising your transport and itinerary for the day. Gibbston Valley Winery, Queenstown, New Zealand. Image Credit: chee.hong / CC by 2.0. There’s nothing quite like rounding out an evening with a drink or two at the local bar, but Queenstown certainly takes it to an icy extreme. Within the city, you’ll find two ice bars, Minus 5º Ice Bar and Below Zero Ice Bar, where everything from the decor and furniture to the drinking glasses have all been crafted from ice. On arrival at either bar, you’ll don warm and cozy jackets, gloves and boots, before settling in for a drink or two with a difference. An experience you’re certain to not forget in a hurry, both bars are open from early afternoon until late, with both alcoholic and non-alcoholic beverages available. Minus 5º Ice Bar, Queenstown, New Zealand. Image Credit: Minus 5º Ice Bar Queenstown. A little slice of serenity just moments from central Queenstown, Queenstown Gardens is the perfect place to sit back, relax and soak up the scenery. Featuring a rose garden, manicured lawns, a variety of plants and trees, and great views of Lake Wakatipu, the historic gardens, opened in 1867, are certainly well worth a visit. Alongside beautifully landscaped gardens, you’ll also find more than enough activities to keep the whole family entertained, with an 18-hole frisbee golf course, a skate park, an ice skating rink, tennis courts and a lawn bowls club all situated within the grounds. Queenstown Gardens, Queenstown, New Zealand. Image Credit: AwOiSoAk KaOsIoWa / CC by SA 3.0. Although Queenstown is perhaps best known as the home of commercial bungy jumping, it was also the first region in New Zealand to welcome commercial white water rafting. Surrounded by incredible scenery and offering several different rafting experiences, it’s easy to see why Queenstown and its two main rivers, the Kawarau River and the Shotover River, have become a popular destination among white water rafters and thrillseekers alike. The Kawarau River rapids generally have a grading of two to three, meaning that they are well suited to first time paddlers, families and groups with mixed abilities, while Shotover River’s have a grading of three to five, indicating that the experience will be more intense and will certainly leave the adrenaline pumping. At 84 km in length, the spectacular Lake Wakatipu stretches from Glenorchy in the north to Kingston in the south, providing plenty of space for a variety of outdoor activities. Set out on a lakeside walk or cycle, enjoy a spot of trout fishing or spend the day discovering what makes the lake so special at your own pace aboard a boat, kayak or paddleboard. The lake’s waters typically sit at between 8℃ and 10℃, even in the summer months, so be sure to pack an extra layer or two if you plan to head out on the water! Lake Wakatipu, Queenstown, New Zealand. Image Credit: Anthony Cramp / CC by 2.0. Set within two hectares of beautifully landscaped gardens, the Kiwi Birdlife Park is home to an assortment of fascinating native birds and animals, including more than 20 endangered species of birds and reptiles. Established in 1986, the park offers daily kiwi feeding sessions, tuatara encounters and other incredible opportunities to get to know more about New Zealand’s intriguing locals. A great place to see iconic species such as the kiwi, tuatara and kea, the park is involved in nationwide conservation projects that work to ensure species survive for generations to come. Tuatara at Kiwi Birdlife Park, Queenstown, New Zealand. Image Credit: Nita / CC by SA 2.0. Built with the intention of showcasing the past, present and future of Queenstown and the surrounding area, the 1.5 km Queenstown Hill Time Walk provides visitors with the chance to learn more about the region and its history, while also enjoying some breathtaking scenery. Taking approximately 1.5 to 2.5 hours to complete, the walk takes you around 500 metres above street level, through Douglas Fir forest and open grassland to the summit of Queenstown Hill. As you complete the trail, you’ll pass six information plates that detail local Maori settlements, the goldrush and other momentous events in the city’s history. Queenstown Hill, Queenstown, New Zealand. Image Credit: Ben Robinson / CC by 2.0. Inspired to discover what makes Queenstown so unique? 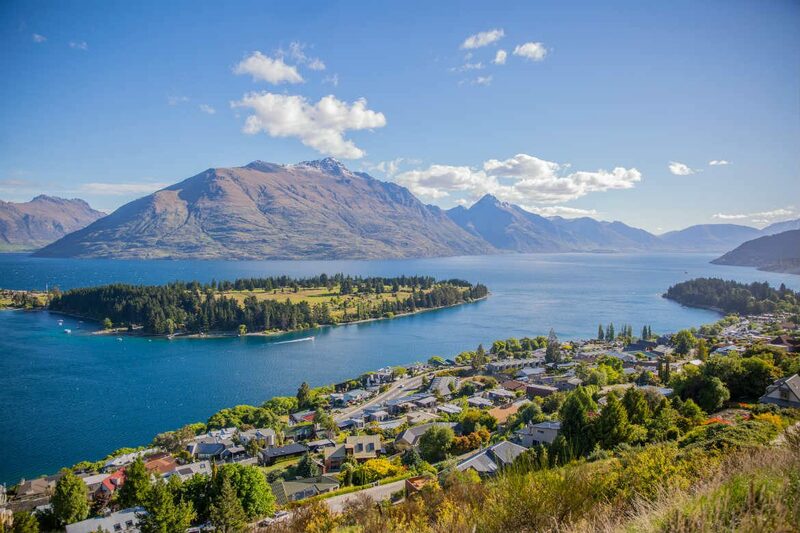 Find, compare and book cheap flights to Queenstown with Webjet today!